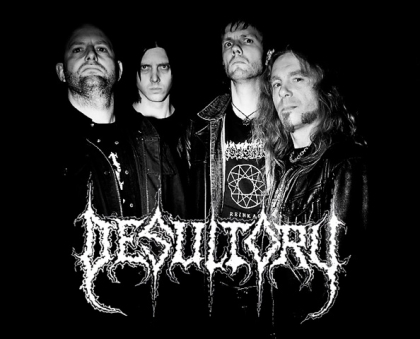 For the very first time, reunited Swedish Death Metallers DESULTORY will re-issue exclusive deluxe editions for both "Into Eternity" and "Bitterness". Both the 1993 "Into Eternity" and 1994 "Bitterness" represent a very important contribution in Swedish extreme Metal history, with a truly unmistakable and distinct style and sound that the band created in the early 90's. One of the few early Swedish bands to seal a three-album deal with Metal Blade Records, these two albums were somewhat criminally underrated in their own time. To commemorate and pay homage to these two landmark albums, both "Into Eternity" and "Bitterness" will be released together with bonus tracks off their pre-Metal Blade era with three demos circa '90 - '91. As an additional treat for the fans, both the albums have been given a new lease of life in the sonic department, with the re-mastering duties courtesy of multi-instrumentalist / producer extraordinaire Dan Swanö at Unisound Studio, Sweden. Both "Into Eternity" and "Bitterness" were previously produced by Tomas Skogsberg, the man responsible for creating some of Sweden's trademark Death Metal records. In an unofficial statement by Dan Swanö: "I have been re-mastering their demos and their first 2 full-length albums. Pulverised will re-release the albums with all demo material as a bonus. The playing time is more than 80 minutes!!!! All the material have been restored to fit nicely together in the same playlist, and it is amazing how much a few small tweaks can change the overall sound from "demo" to "album". A funny anecdote is that I "forced" the band to go to the home of Tomas Skogsberg in the middle of nowhere and pick up the original DAT tapes of the demos. Maximum quality achieved!!!" On top of that, both album covers and booklet layouts have also been revamped for a more modern feel, re-designed and produced by Greek graphic artist Anestis Goudas of Derz Design (Rotting Christ, I.C.S Vortex, Shagrath, etc). Also included in the CD booklet is a detailed run-down on the entire DESULTORY history in the form of liner notes written by Terrorizer Magazine writer Olivier "Zoltar" Badin, with special assistance from DESULTORY frontman Klas Morberg. DESULTORY guitar-player / singer Klas Morberg comments: "When I write these lines in late September 2010, it is exactly 21 years since the DESULTORY journey began back in 1989. As we're now writing a new chapter in our history by releasing the new album, we would also like to tell the complete story of the past. We are really happy that we now together with Pulverised Records are able to re-release "Into Eternity" and "Bitterness", both brilliantly re-mastered by Dan Swanö. We have also managed to hunt down the master-tapes of the 3 demos that were made before recording of "Into Eternity". All these tracks have also been re-mastered and are included on the albums together with extensive liner notes that tells the complete story of the band. So, for all of you who have been with us from the start and everyone else that wants to know how it all began...Here it is - Enjoy!